SWOT analysis of Dell Computer. 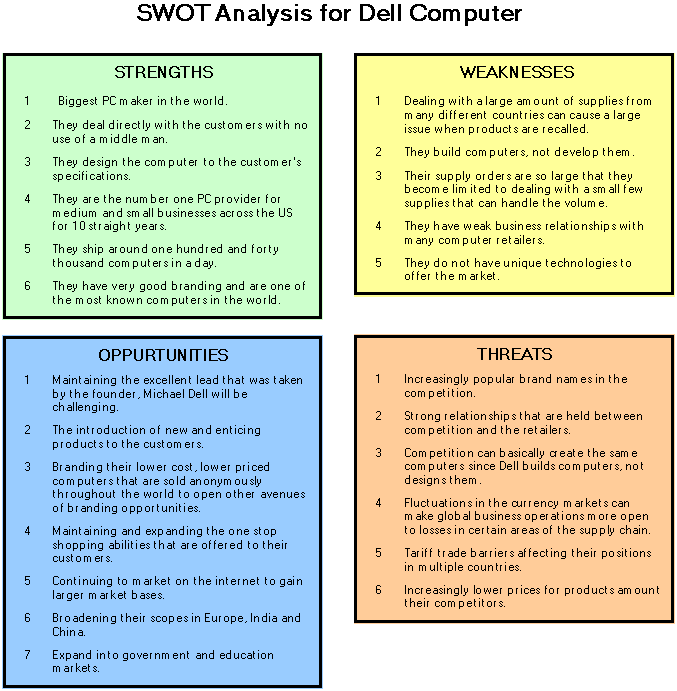 This SWOT analysis of Dell Computer includes a color SWOT report created by SWOT Manager software. This page provides the strengths, weaknesses, opportunities, and threats for Dell Computers. Biggest PC maker in the world. They deal directly with the customers with no use of a middle man. They design the computer to the customer's specifications. Their assembly is done at a fairly inexpensive cost. They offer their customers the ability to track their delivery. They are the number one PC provider for medium and small businesses across the US for 10 straight years. They ship around one hundred and forty thousand computers in a day. They have very good branding and are one of the most known computers in the world. Dealing with a large amount of supplies from many different countries can cause a large issue when products are recalled. They build computers, not develop them. Their supply orders are so large that they become limited to dealing with a small few supplies that can handle the volume. They have weak business relationships with many computer retailers. They do not have unique technologies to offer the market. Maintaining the excellent lead that was taken by the founder, Michael Dell will be challenging. The introduction of new and enticing products to the customers. Branding their lower cost, lower priced computers that are sold anonymously throughout the world to open other avenues of branding opportunities. Maintaining and expanding the one stop shopping abilities that are offered to their customers. Continuing to market on the internet to gain larger market bases. Broadening their scopes in Europe, India and China. Expand into government and education markets. Increasingly popular brand names in the competition. Strong relationships that are held between competition and the retailers. Competition can basically create the same computers since Dell builds computers, not designs them. Fluctuations in the currency markets can make global business operations more open to losses in certain areas of the supply chain. Tariff trade barriers affecting their positions in multiple countries. Increasingly lower prices for products amount their competitors.